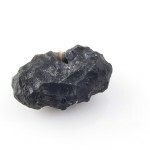 The colour of most tektites (see tektites overview) is at the first sight black (in the case of thin cuts the colour is brown or yellowish). 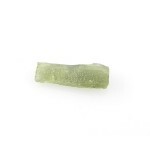 Beautiful green colour of moldavites is unique and rare among tektites. 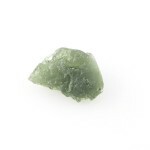 Another green kind are very rare and valuable Urengoy tektites (only three pieces have been found) and Georgiaites, which are also rare and valuable. 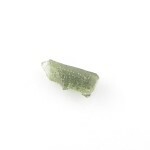 The green colour of moldavite is highlighted also thanks to their transparency. My favourite colour of moldavites is olive green and intense bottle green. They are typical moldavite colours. On the other hand poisonous green moldavites are very rare. 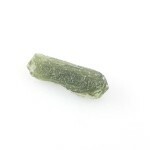 There are also two­coloured moldavites, which are very valuable. Ground and polished moldavites with lighter shades are often used in jewellery. They are transparent and give the best effect. 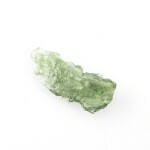 In South Bohemia bottle green and light green moldavite are the most frequent ones. Less frequent are pale green ones (found in the area of Radomilice), olive green and brownish ones (e.g. the area of Dobrkovska Lhotka Zatacka). Poisonous green moldavites are quite rare in South Bohemia. Moravian moldavites are predominantly olive green or brown. What causes the colour of moldavites? The colour and transparency is given by their chemical coposition. The content of iron (FeII, FeIII) and manganese (MnII) influence the colour the most. 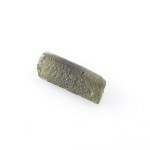 Bivalent iron prevails in moldavites and has the main influence on green colour. Brown colour is caused by the content of trivalent iron. The higher the ratio of the content of FeIII/FeII the more brown the moldavite is. Transparency is caused by a low content of titanium. Poisonous green moldavites have a higher content of nickle and alkaline earths (MgO, CaO) and a lower content of Potassium oxide (K2O).